Description AST487 is an inhibitor of RET kinase with IC50 value of 0.88 μM. NVP-AST487 given p.o. evoked a dose-dependent inhibition of growth of NIH3T3-RETC634W xenografts, with doses >30 mg/kg/d causing significant reductions in tumor size. The effects of the compound on RET expression and phosphorylation in tumor extracts was analyzed 6 h following the final treatment. Reductions in tumor RET phosphorylation in NVP-AST487–treated animals were clearly seen, particularly at doses ≥30 mg/kg. Interestingly, there was also a dose-dependent decrease of RET expression, with one of three tumors analyzed in the 30 mg/kg group and three of three tumors in the 50 mg/kg group showing a dramatic reduction in RET protein levels. 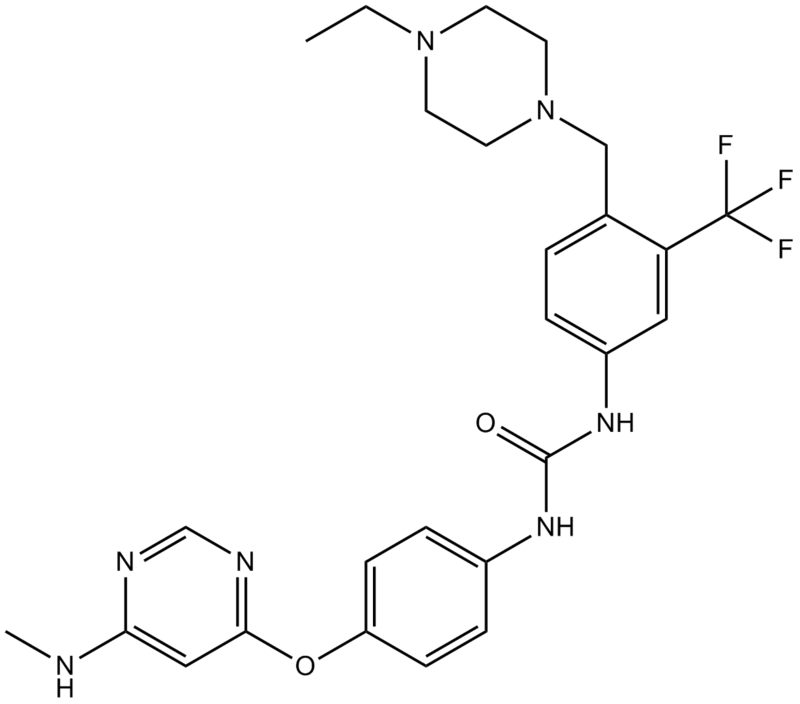 AST487 is an inhibitor of RET kinase with IC50 value of 0.88μM . AST487 belongs to the N,N’-diphenyl urea class. It inhibit the activity of RET kinase as well as many other kinases( such as KDR, Flt-3 and c-Kit) in vitro. In the cell assay, the inhibition effect of AST487 is displayed both in PC-RET/PTC3 cells and TT cells, which harbor an endogenous activating point mutation of RET (RETC634W). AST487 decreases RET autophosphorylation and activation of PLCγ and ERK with a dose-dependent manner. Additionally, AST487 is also found to inhibit the growth of human thyroid cancer cell lines with RET, but not BRAF mutations. It supports the selectivity of AST487 for RET. 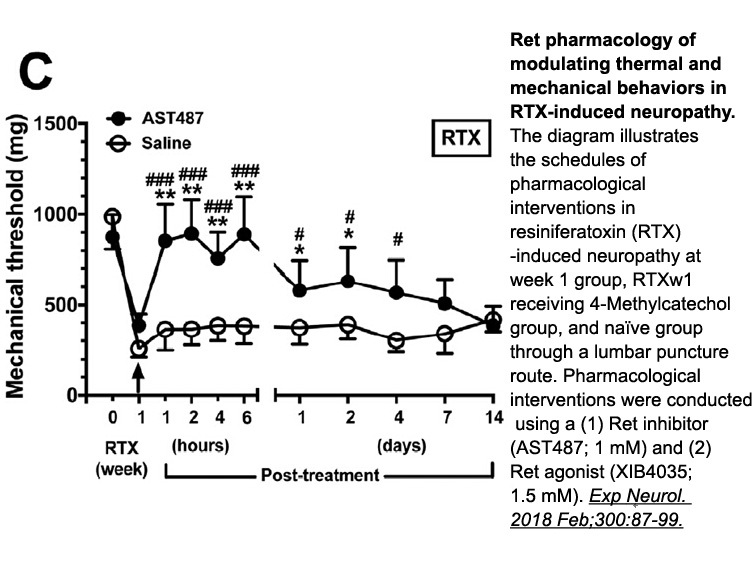 In vivo assay shows that AST487 causes significant reductions in the size of NIH3T3-RETC634W xenografts with doses >30 mg/kg/d and oral administration of AST487 at 50 or 30 mg/kg/d decreases mean tumor volume in mice .